I was hoping to write this up yesterday but i just got so busy. The prior project is 100% finished and paid up. Which means i have a nice budget to start working on a new motion control system. Rather than write out the code (i already have the framework worked out for a multi axis system that seems to work fairly well but dont have the time to write up a proper interface and deal with the debugging) I have opted to use Dragonframe. For anybody who is not familiar with Dragonframe, it is a stop animation control system. It will control the camera, motion control gear, and lighting. This is industry standard gear that has been used in stop motion animation films such as The Box Trolls, and Shaun of the Sheep. It has some incredible capabilities and is also capable of doing timelape, and I am very excited to get the system up and running. Integrating it with my Biolapse Control Module should be a piece of cake. The BCM will still control the environment (temp, humidity, lighting cycles, water cycles) but it will also be able to trigger the Dragonframe system and have Camera control, live view, playback, full motion control and even adjustable lighting control (brightness and color). The Moco rig I am working to put together will be an overhanging gantry system capable of X/Y/Z/Pan/Tilt/Roll/Focus. This is going to be one bitching setup for filming plants, unlike anything anybody has done before. I had really sort of had my heart set on a Nikon D810. I have been drooling over that camera ever since it came out. I am not a fan of shooting with Canon. I don’t like the interface, menus, or ergonomics. (That is just personal preference, nothing against canon) The sensors also lack dynamic range compared to their Nikon Counterparts. But the fact is Canon offers a better live view with dragon frame, nearly 4x the resolution. The 6D is also about half the price of the D810. Considering this is going to be a studio queen and will probably never come off the robot, the canon makes more sense. I am still working on the design of the gantry support system. I plan to build it out of 80/20 extrusion, with 1500mm ball screws for the X/Y axis and using my Chronos Lite Mini for the Z axis. The overall camera envelope will probably be about 4xft x 4ft x 20 inches. I have some considerations i need to work through before I start ordering parts. I want as little wasted expenditure as possible. Why would I use the Dragonframe DMC-16 rather than building my own arduino controller? Especially when the DMC-16 is so expensive? Well I get why folks would question that decision knowing my background, however the DMC-16 is capable of moving the stepper motors 10x faster than the Arduino method. I want this system to be usable for both live action and timelapse. While it is pretty expensive, it really simplifies a lot of things for me as well. I want as much of this system to be turn-key as possible. For the pan/tilt/roll i have my mind set on a ServoCity PT-2100 with roll attachment. Ill ditch the motors that come with it and retrofit it with harmonic drive geared stepper motors. I am hoping to get some pretty high levels of accuracy. I am real excited about this system. There are some very important design considerations i need to work through, so this will not simply be thrown together. I will be blogging about the building/testing process as things develop. OTHER THINGS I have ordered. I have 3 new grow lights coming in as one of the two I have gave up the ghost. I am a lot better at growing carnivorous plants under LED than in my makeshift window greenhouse. (yes for now i plan to keep shooting some carnivorous plants) So the plan is to build a grow area in the studio separate from the shooting area. Reverse Osmosis water Filter. I am sick and tired of buying gallon after gallon of distilled water. Carnivorous plants hate tap water, it kills them. This RO filter will allow me to get all the pure water i need without buying all those plastic gallons. 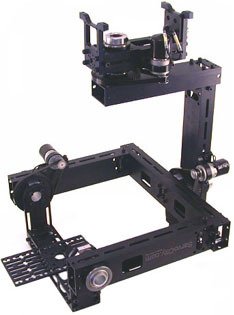 Manfrotto 410 geared tripod head. I have one of these and it makes lining up macro shots a breeze. I plan to constantly shoot with 3-4 cameras, so why not make my life easier with a 2nd one? Venus Laowa 15mm f/4 Wide Angle 1:1 I AM SO EXCITED FOR THIS LENS! I have wanted this ever since I saw the first test reports of this. Talk about a DYNAMIC macro lens! So stoked! And that for the most part is it, other than wires, cables, power for the canon. So keep an eye out for updates. I have been shooting a sundew the last few weeks and hope to have a blog post with some info about that and some samples of the results.